Math Education, Math is Easy! Today, we’re going to learn about the Whole Number Table. 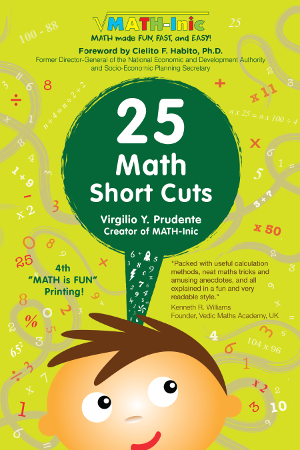 It’s a pretty cool tool that can help you work out even tricky Math problems. Want to know how? Let’s take a look. This is the Whole Number Table. You may have seen one of these before. It can help you understand how numbers work. You can see different kinds of patterns in the Whole Number Table. For example, in the first row, all the numbers are single digits. And they increase by 1 as you go from left to right. Then in the second row, all the numbers start with the same number–they all start with one. In the third row, all numbers start with 2. Notice how in all the rows except the first one, all the numbers start with the same number? They also increase by one as you go from left to right. Now check out the first column. What do you notice? All the numbers end with the same number. The same goes for the rest of the columns too. Look at the starting numbers. They increase by one as you go from top to bottom. The Whole Number Table also helps us remember that we count pretty much the same way we read. We start at the top left corner, from left to right, then down one row, and start from the leftmost going to the right again. So what else can you do with the Whole Number Table? Watch this short video to know more. 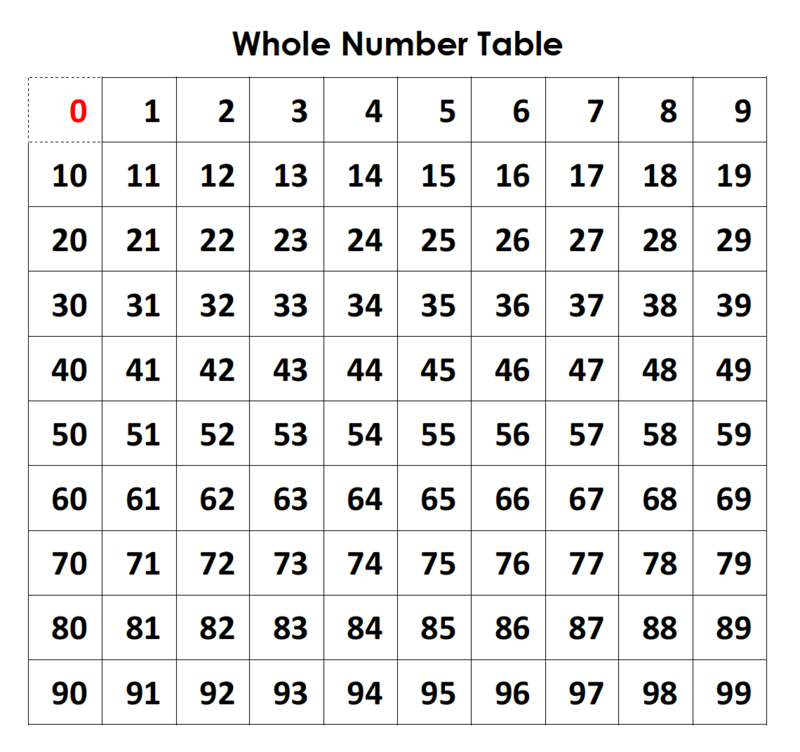 Do you want a printable copy of the Whole Number Table? Sign up for our email list below and we will send you the download link via email. 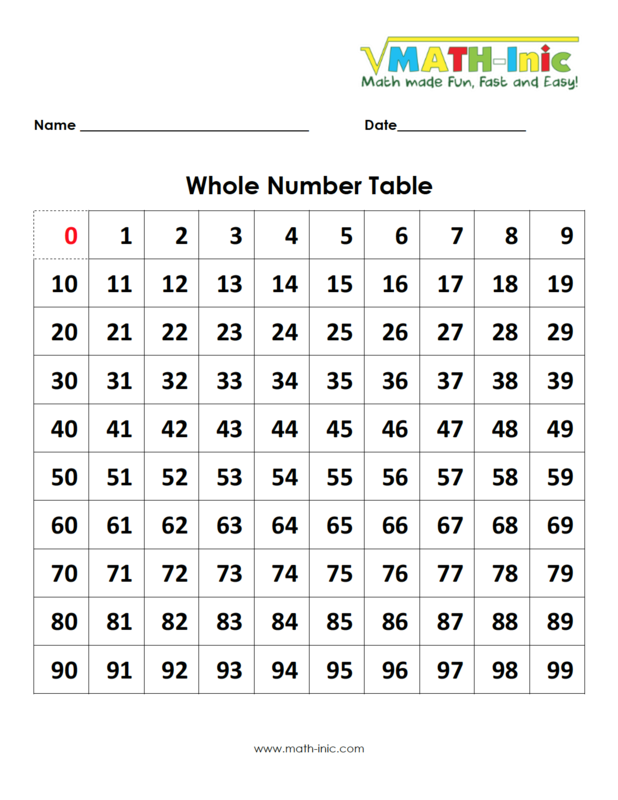 Get the MATH-Inic Whole Number Table printable file when you sign up for our email list. No question, Math is important for mathematicians, scientists, engineers, and even bankers. But what if your child does not want to become one? Or why should they care, they're only kids!